Over the course of 15 years and almost as many albums and international tours, Australian popstars The Lucksmiths have penned some of the most adored songs this side of the pop underground and built up a massive fanbase in the process. Most recent studio album ‘Warmer Corners’ received considerable praise, with Pitchfork calling it “idiosyncratic but accessible, literate but unpretentious, gentle but not weak, sincere not so much in presentation as in presence”. Two singles lifted from the album — “A Hiccup in Your Happiness” and “The Chapter in Your Life Entitled San Francisco” — both received heavy rotation across the globe. The latter also found its way onto Qantas Airlines in-flight playlist in 2006 — an achievement not celebrated lightly by a band with an enduring penchant for the somewhat ridiculous and irrelevant. More recently, 2007 saw the release of a b-sides, rarities, and live compilation entitled ‘Spring a Leak’ with an accompanying set of US tour dates. At 45 songs in length, this exhaustive double-CD was well received and hearty enough to sate even the most impoverished Lucksmiths fan whilst awaiting a new batch of songs. In reviewing the album, Time Out Chicago declared “If a band can be this good on its cast-offs, imagine what the albums are like”. 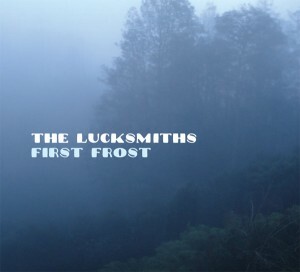 A trip to Tasmania has yielded ‘First Frost’—the finest and most dynamic Lucksmiths album to date. Camped out in the wilderness, the band was free to explore and expand the musical palette, and with all four members contributing songs, the end result is a 14-song masterpiece bound to surprise anyone who thought they had The Lucksmiths pegged as sounding too much like The Lucksmiths. On the album, the bands’ trademark lyrical hooks shine warmer than ever. Opening cut "The Town and the Hills" sets out some of the album’s central themes, examining the distance (geographical and metaphorical) between city and country. Meanwhile, "California in Popular Song" is a sweet slice of sun-kissed pastoral pop that combines sweeping strings, a throaty low-down guitar, some gentle fingerpicking and Tali White's pensive vocal to become your new favorite Lucksmiths song. Recent live hits, the jangly "Good Light" and the surprisingly glam-rockin' "A Sobering Thought (Just When One Was Needed)"—the latter concerning a late-night drunken escapade at a public swimming pool — both receive a fine rendering on ‘First Frost’. Elsewhere on the album, The Lucksmiths' familiar strum is traded in for brief dalliances with a disorderly fuzz pedal, a choir of misplaced mittens, and a bird that just wants to know why you got drunk. Intrigued?